how to vary transparency levels. CSS still has plenty of surprises in store! Let's now turn to the vast topic of color. How do you mean, "vast"? You already know about the property used to change the text color: it's color. We're going to look at the various ways of specifying color, as there are several. The most simple and most convenient way to choose a color is to type its name. The only drawback with this method is that there are only sixteen so-called "standard" colors. Although there are other informal colors, I won't bother showing them to you as they don't necessarily work the same way in all browsers. The next figure shows the sixteen colors you can use by simply typing their name. You can see the result in the next figure. But sixteen colors is all the same a bit limited when you consider that most monitors can display sixteen million. Fortunately, there are several ways in CSS to choose a color from all the existing ones. The first way I'll show you is the hexadecimal notation. Although it is commonly used on the Web, there's also another method that we're going to see later. This is what a color name in hexadecimal looks like: #FF5A28. Simply put, it's a combination of letters and numbers that specify a color. You should always start by writing a hash character (#) followed by six letters or digits from 0 to 9 and A to F.
These letters or numbers work in pairs. The first two digits specify the quantity of red, the next two the quantity of green and the last two the quantity of blue. By mixing these quantities (which are the color's Red-Green-Blue components), you can get the color you want. Thus, #000000 corresponds to black and #FFFFFF to white. But don't now ask me what combination to use to produce the "sunset" orange color as I have absolutely no idea. Some drawing software programs such as Photoshop, Gimp and Paint.NET, let you specify the colors in hexadecimal. You can then easily copy and paste the hexadecimal code of a color in your CSS file. Note that there is a shorthand notation: you can write a color with only three characters. For example: #FA3 is equivalent to writing #FFAA33. What does RGB mean? Red-Green-Blue, which is abbreviated as "RGB". As with the hexadecimal notation, to choose a color, you have to define a quantity of red, green and blue. This odd story about quantities of red-green-blue again? 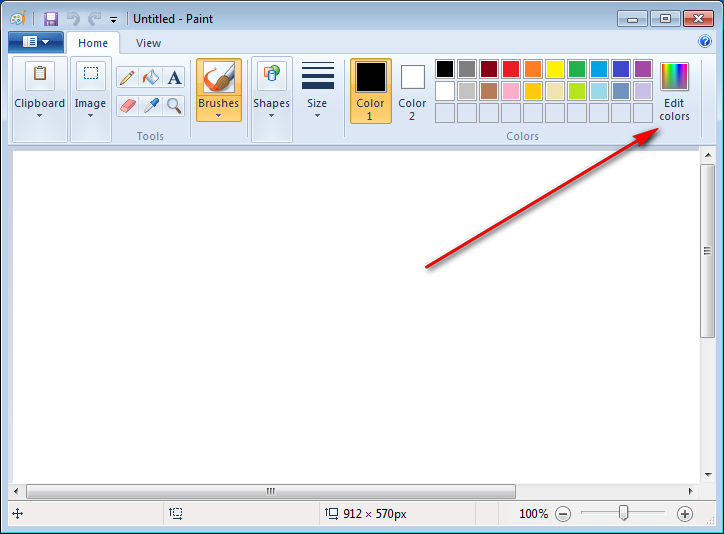 Start the Paint program from the Start menu. Go to the Edit colors section, as shown in the next figure. A window opens. In the box that appears on the right, move the sliders to select the color you want. Suppose you have a mad desire to write your titles <h1> in pink (only supposing). 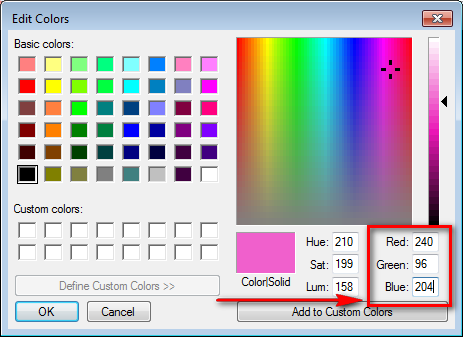 Select the color in the window, as shown in the next figure. Note the corresponding quantities of Red-Green-Blue indicated at the bottom right of the window (in this case 240-96-204). Enter these values in the same order in the CSS file, as shown in the code below. As you could see in the example, to use the RGB method, you have to type rgb(Red, Green, Blue) replacing "Red, Green, Blue" by the corresponding numbers. For information, these quantities are always between 0 and 255. To specify a background color, use the CSS background-color property. This is used in the same way as the color property, in other words, you can type the name of a color, enter it in hexadecimal notation or again use the RGB method. To specify the web page background color, you have to work with the <body> tag. Indeed, <body> corresponds to the whole web page, so by changing its background color you'll change the color background of the page. The result of this code can be seen in the next figure. But you asked for the text of the <body> tag to be written in white, and all the <p> paragraphs and <h1>titles took this color. Why is that? Indeed, I wanted to take this opportunity to talk to you about this. This is known as inheritance. But I can reassure you right now, nobody died. In CSS, if you apply a style to a tag, all the tags that are inside will take the same style. It's actually easy to understand and intuitive. As you know, the <body> tag contains among others the <p> paragraph and <h1> title tags. If I apply a black background color and a white text color to the <body> tag, all my titles and paragraphs will also have a black background and white text... This phenomenon is called inheritance: the tags that are inside another tag are said to "inherit" its properties. This also accounts for the name "CSS" which means "Cascading Style Sheets". CSS properties are inherited in cascade: if you give a style to an item, all the sub-items will have the same style. 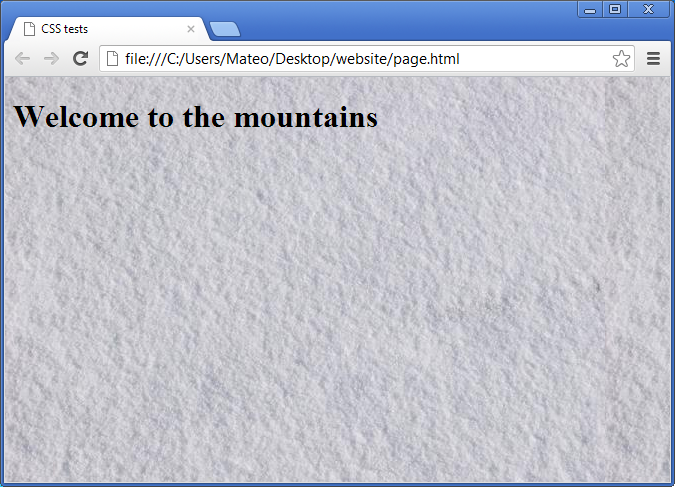 This means that ALL the text of my web page will necessarily be in white? No, not necessarily. If you say later on that you want your titles to be in red, this style will take precedence and your titles will thus be in red. 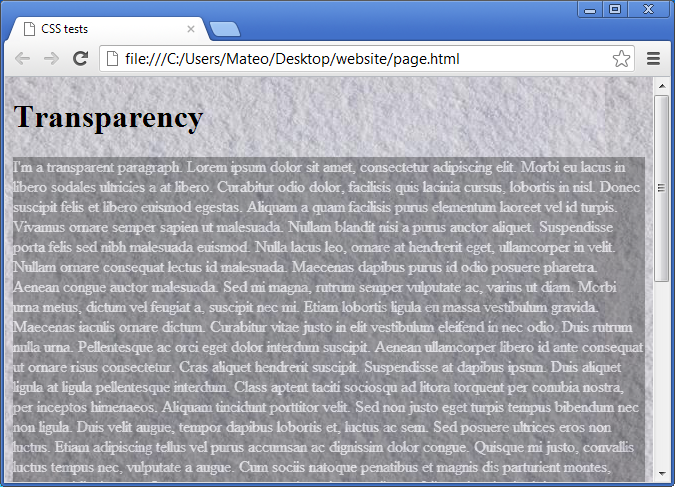 However, if you don't specify anything in particular (as we did earlier), then your titles will inherit the white color. Let's be clear, this doesn't just work for the color alone. All CSS properties are inherited: for example, you can assign bold in the <body> tag and all your titles and paragraphs will be in bold. People tend to think that they can only change the background color of the page. 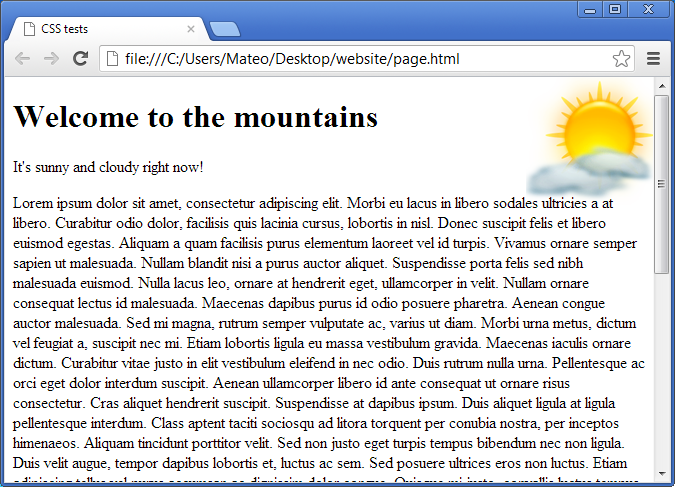 This is not so: you can change the background of any item: your titles, your paragraphs, certain words, etc. In this case, they will appear highlighted (as if marked with a marker pen). The red background color applies to the text of the <mark> tag. Indeed, even if the background of the page is black, it is the CSS property of the most specific item that has priority (next figure). ... you might think that there would be a conflict. If the important text is part of a paragraph, what size should it be given? 1.2 em or 1.4 em? CSS decides that the most specific declaration takes precedence: as <strong> corresponds to a more specific item than paragraphs, the text will be written in 1.4 em. In the following examples, I'm going to change the background image of the page. However, as for the background color, don't forget that the background image does not necessarily apply to the whole page. 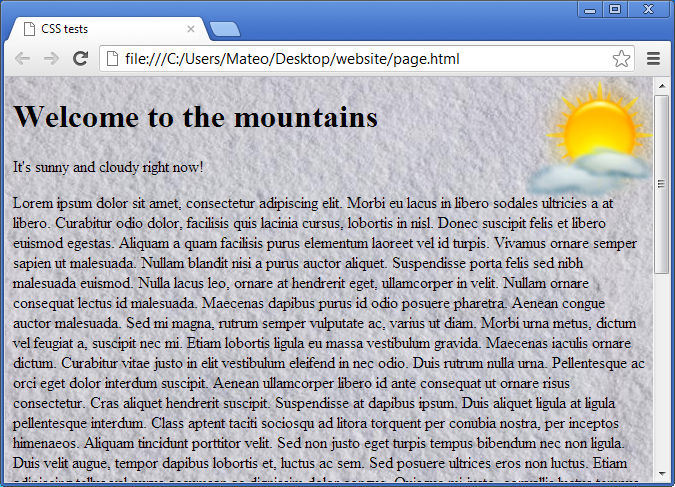 You can also put a background image behind titles, paragraphs, etc. Of course, your background is not necessarily in PNG, but can also be in JPEG or GIF format. The address indicating the location of the background image can be written as absolute address (http://…) or as a relative address (fond.png). Be careful when you write a relative address in the CSS file! 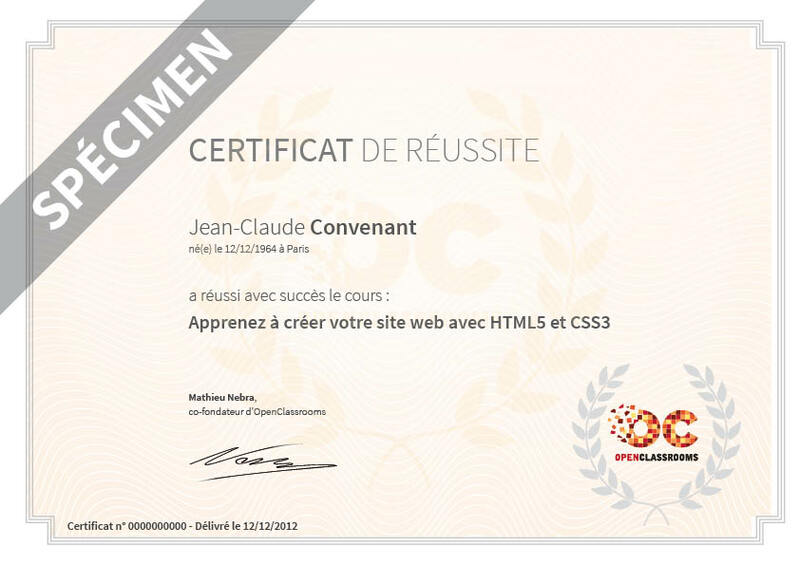 The address of the image must be specified relative to the .css file and not relative to .html file. To simplify things, I advise you to place the background image in the same folder as the .css file (or in a sub-folder). The background-image property that we've just seen can be supplemented by several other properties that allow the behavior of the background image to be changed. scroll: the background image scrolls with the text (default). no-repeat: the background will not be repeated. The image will be unique on the page. repeat-x: the bottom will be repeated only on the first line, horizontally. repeat-y: the bottom will be repeated only on the first column, vertically. repeat: the background will be repeated in a mosaic pattern (default). You can specify the required position of the background image with background-position. This property is only useful if it is combined with background-repeat: no-repeat; (a background that does not repeat). If you use a lot of properties in relation to the background (as is the case in the last example), you can use a sort of "super-property" called background whose value can combine several previously seen properties: background-image, background-repeat, background-attachment and background-position. The order of the values doesn't matter. You can combine values in any order. You don't have to enter all the values. So if you don't want to enter fixed, you can remove it without any problem. The first image of this list will be placed on top of the others (figure below). So beware, the image declaration order is important: if you reverse the sun and the snow in the CSS code above, you'll no longer see the sun! Note that multiple background images work on all browsers except older versions of Internet Explorer, which only recognize this feature as of version 9 (IE9). One last thing before finishing with background images: In all these examples, I've applied a background to the whole page (body). However, this should not make you forget that you can apply a background to any item (a title, a paragraph, some words in a paragraph, etc.). So for practice, I advise you to try to apply a background to your titles or paragraphs. 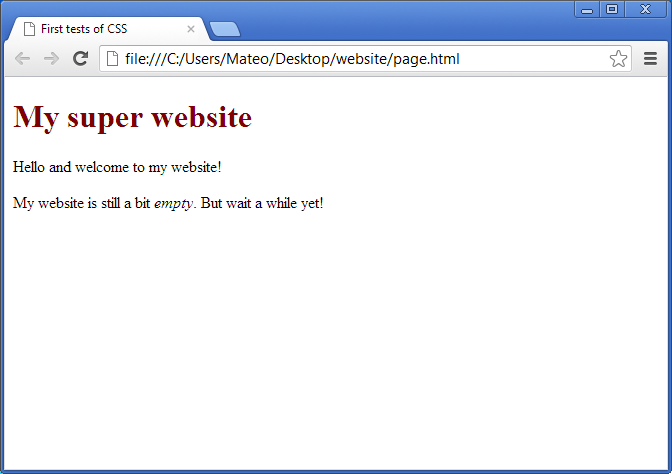 If you have a bit of talent (unlike me), you'll no doubt be able to make your web page look quite nice. CSS allows us to very easily vary the transparency levels of items! 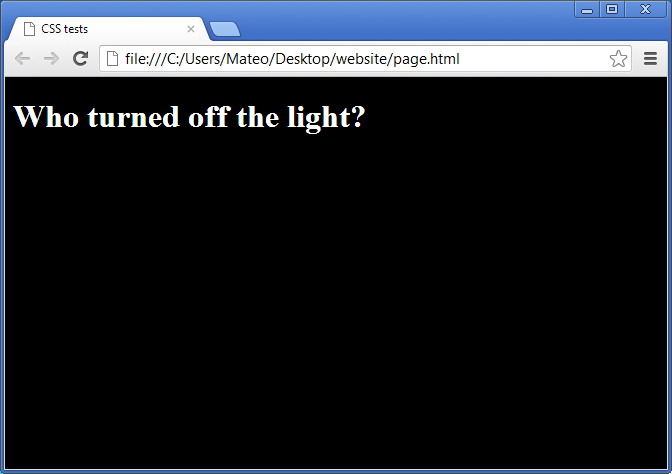 To do this, we'll use CSS3 features: the opacity property and RGBa notation. The very simple opacity property is used to specify the opacity level (which the reverse of transparency). With a value of 1, the item will be completely opaque: this is the default behavior. With a value of 0, the item will be completely transparent. So you have to choose a value between 0 and 1. With a value of 0.6, your item will thus be 60% opaque ... and you'll be able to see through it! Here's an example that will give you an idea of transparency. You can see the result in the next figure. Note that transparency works on all browsers, including Internet Explorer as of IE9 upwards. If you apply the opacity property to an item of the page, all the content of this item will be made transparent (even images, other blocks inside, etc.). If you just want to make the background color transparent, it's best to use the RGBa notation that we're going to find out about. CSS3 provides us with another way to vary the transparency: the RGBa notation. This is, in fact, the RGB notation we saw before, but with a fourth setting: the transparency level (called "alpha channel"). With a value of 1, the background is completely opaque in the same way as above. With a value of less than 1, it's transparent. It's as simple as that. You can get exactly the same effect as with opacity just using the RGBa notation. Give it a try! This notation is known by all newer browsers, including Internet Explorer (as of IE9 upwards). For older browsers, it is recommended to specify the conventional RGB notation as well as RGBa. So although for these browsers, the background will not be transparent, at least there will be a background color. You change the text color with the color property, and the background color with background-color. You can specify a color by enter its name (black, for example), in hexadecimal form (#FFC8D3) or in RGB notation (rgb(250,25,118)). You can add a background image with background-image. You can choose to attach the background image, display it as a mosaic pattern or not, and even position it anywhere on the page. You can make a portion of the page transparent with the opacity property or with the RGBa notation (same as the RGB notation, with a fourth value indicating the transparency level).